It was a beautiful September day for Laura and Donald's wedding at St James' The Less Church with reception at The Houston House Hotel. It was at the hotel where the day would start with the bridal preparation photos. Laura was one of our make-over shoot competition winners with hair and make-up by CityBrides Hair & Make-Up. It was great to catch up with Helen and Emma MUA again, they always do an amazing job. The morning flew by with family popping in and out of the bridal suite to give Laura the best of luck for the day ahead. The bridesmaids were brilliant all day and Laura had very thoughtfully given all the bridemaids and flowergirl gifts as a thank you. A lovely touch. I then headed of to James The Less Church in Penicuik to meet Donald and the guys as they greeted all the guests on arrival. It's a beautiful little church tucked away on the far side of Penicuik. Massive thank you to the minister who was very accommodating and understanding when it came to getting photographs in the church. Laura arrived in a vintage Beaufort car and she looked just stunning! We paused for a few shots at the front door of the church before heading inside for the wedding ceremony. I love setting up the confetti photos at any wedding but at James the Less Church there is a lovely long path which is tailor-made for a confetti run. It was great fun and the newlyweds expressions of joy made it all worthwhile. It was then back to the wedding reception venue where Giovani was waiting with two glasses of champagne for Laura & Donald. As the guests were a few minutes behind us we took a walk around the beautiful gardens for the bride and groom portraits. Everywhere you look there's a photo opportunity at the Houston. After the family photos it was time for the speeches and then time for me to say goodbye. Perfect wedding? Oh, you bet! The Houston House Hotel is a wedding venue I haven't been to for almost exactly a year now. Always have a great time there but this time it was mostly due to Lauren & Jamie. Hopefully the fun of the day shines through the photographs as it was a day when time just flew by. Started off at Lauren's parents house for the getting ready photos before heading to St Mary's at Dalmahoy for the wedding service. A beautiful little church just inside the grounds of the Dalmahoy Golf and Country club. Once we arrived at The Houston House Hotel, Lauren and Jamie were greeted by their guests before the wedding breakfast. The speeches were brilliant and the same can be said for the dancing too. Just brilliant! I think 2012 has been by far the wettest year of the century so far. Mind you, I said that about 2011! 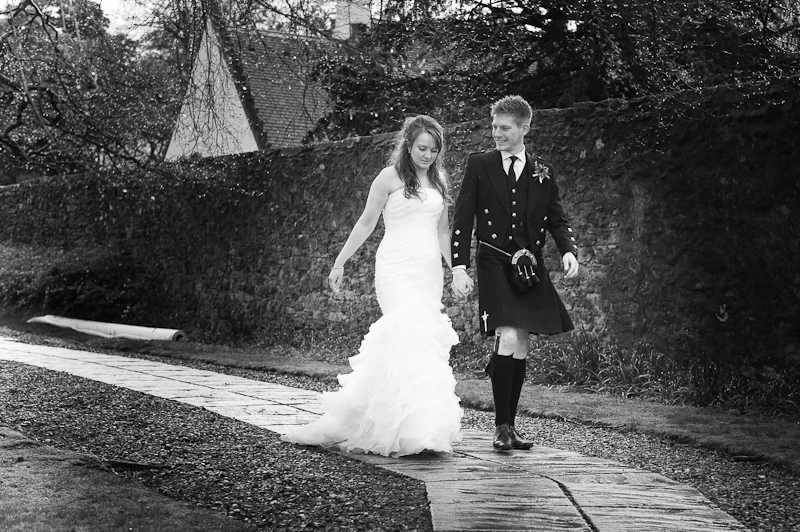 It was another rainy day in West Lothian as Sarah & Gavin celebrated their wedding day. They were both brilliant all day. Rain? What rain. We had everyone outside for the group shots with the Ushers holding umbrellas over everyone before dashing out of the way for the photograph. You were all immense guys. Thank you. We did get a little break from the rain later in the evening so managed to get a few shots done outside before the heavens opened again. I don't think that would have mattered though. Sarah & Gavin knew they wanted great shots in the grounds of Houston House, that's one of the reasons they chose they venue. It's gorgeous. Thank you both for being so brilliant on the day. I had a great time photographing your wedding and you really did make me feel like one of the guests. Thank you both for everything.